I also think most of us will agree - by us, this time I mean consumers - that the question isn't IF a small business should use social media, the question is HOW? If you're a worldwide brand, maybe your Mother's Day comments should ride the coattails of a celebrity story, a la "Do you admire Angelina Jolie's maternal style?". If your business focuses on a 25-mile radius, though, leave Angelina alone. You can focus on something much more personal, much more real. A bring-a-friend offer is the ideal engagement tool for you and your customers. For example, "Bring a friend who's like a mom to you" or "tell us what your mom did that drove you crazy, that you do now and both of you get 20% off your next service." See? It's easy. And it's important, because no matter how small your business, you don't want it to get any smaller! The hard part about any form of marketing is finding the time to do it. The next Local Gets Social Tip will focus on finding the time to reach your market and attract new customers. Don't let the Pepsis and Cokes of the world define your marketing plan. Yours is probably better, anyway. Need a little help getting on the right social media track? Find out what a professional copywriter can do for you. << it's a safe! Isn't that cool?! Is Slideshare the new content marketing king? And if a picture on Pinterest is worth more than a thousand words, what's Panasonic trying to say? Repeat after me: don't confuse the tools with the trade. Marketing, advertising, and brand identity still have more to do with words and customer service than they do with Instagram, Facebook, Twitter, Digg, Foursquare or even MySpace. And you can +1 this, or pin that to your wall. This is personal. It's about pickles, and perception. When I was young, my mom made refrigerator pickles, all the time. We loved to eat them. Opening the refrigerator and grabbing a forkful of the sweet, tangy cucumber slices on a hot day, particularly after having roasted and splashed away the afternoon at Mt. Air Swimming Pool, defined summer. Proof! That's my mom's handwriting on the recipe. 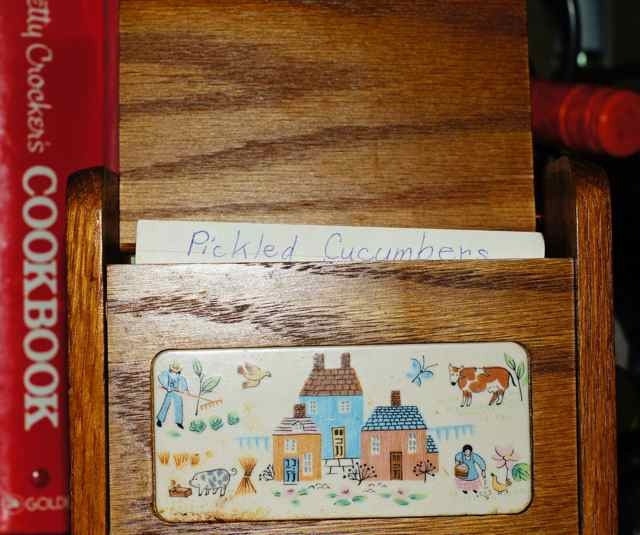 40 or so years after this memory was recorded, I found out I'm the only one in my family who remembers "refrigerator pickles." "I'm sorry. I don't remember them," my dad told me. "Well mom will," I replied rather haughtily. And so I came face-to-face with the revolting fact that some memories are invented, or at least embellished. My memories. 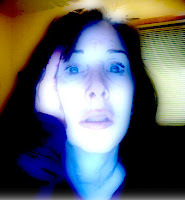 It was so disconcerting I decided to quit thinking about it. At least I have the recipe for those pickles, and mom's kind assurances that yes, she probably made them more than once. In an effort to recover from the jolt of realizing my sweet memories may be more pixie dust than pickles, I've made those pickles three times this summer already. I'll make them again, too, because they're every bit as good as I remember. Or at least I think they are. To set the record straight, I should point out that they're not even real pickles. They're "Pickled Cucumbers." (The injuries continue.) Now when I crunch them, made-up memories swirl in my head with nagging little questions. Questions like, what kind of memories will my kids have 40-odd years from now? I hope they're sweet and tangy, like mine. Even if they're mixed up with a little imagination. Most moms I know beat themselves up frequently because they're not providing their kids with the idyllic childhoods they (the moms) remember. But what if the recipe for a delicious, tangy childhood is really easy? What if it's based on selectively embellished memories? Wouldn't that be a relief? Maybe the reason I don't remember my mom griping about driving back and forth to the pool and everywhere else my friends and I wanted to go is because she didn't complain. But I doubt it. Do you know any moms who don't complain about the driving and other humdrum tasks that comprise summer activities? 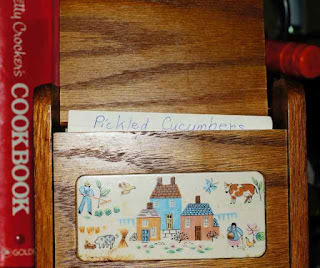 Maybe I don't remember Mom's complaints because the pickles and a few other sweetly embellished memories (however inaccurate) crowded out the everyday grumbling. The idea gives me hope. Maybe my kids will remember me as a little sweeter than I really am, and my cooking as a little better than it is. I sure hope so. For posterity, then, here's the recipe that inspired my somewhat inaccurate but quite idyllic summer memory. In case you're wondering, my kids didn't exactly love these at first bite. But I'm hoping they remember these pickles - or something else, whether I actually made it or not - as the absolutely perfect summer treat. Combine vinegar, sugar, water, salt and pepper in a saucepan. While you bring it to a boil, use a vegetable peeler or sharp knife to remove strips of peel lengthwise from cucumbers, leaving alternate strips of peel intact. Slice cucumbers and place in bowl. Add vinegar mixture. Sprinkle with dill. Toss gently. Cover and chill at least two hours. Add memories and enjoy. This personal essay is included in Dumb Things We Say to Dogs. A much more scientific explanation about how memories are distorted and invented can be found on PsyBlog. "I believe newspapers that intensively cover their communities will have a good future" -- Warren Buffet, June 2012 message to employees of the newspapers he owns. Apparently Moody's doesn't share his view, at least as a short-term investment.